Last year we served the players at The World Series of Beer Pong® their largest helping of side events ever, and this year we plan on filling you up even more! Having exceeded over $20,000 in Side Event prizes at WSOBP® XII, The World Series of Beer Pong® XIII Side Event prizes will look to top $40,000! With the emergence of The Best Of the MidWest™ 6v6 Draft Tournament quickly becoming a favorite amongst players, we’ve decided to shuffle the deck a bit and implement the first ever World Series of Beer Pong® 6v6 Draft Tournament to the line-up for WSOBP® XIII. The WSOBP® Draft Tournament registration will both open and close a bit earlier than the rest of the 2018 side events in order to establish captains. The captains will be appointed by BPONG.COM™ and selected based on the skill levels of each registered player. Recent major tournament placements will be considered, as well as bid wins and overall career achievements. A Live Draft party will be held poolside and streamed so you can follow all the picks as they happen! If you are interested in participating in The World Series of Beer Pong® 6v6 Draft Tournament, make plans to be in Las Vegas by July 4th, 2018! And to help you out, our hotel discounts at Westgate will have you covered on dates both leading up to and following the Main Event. Beyond the exciting new addition of the 6v6 Draft Tournament, players will also find some of the new events we implemented last year that compliment the classic events that have been around for years! 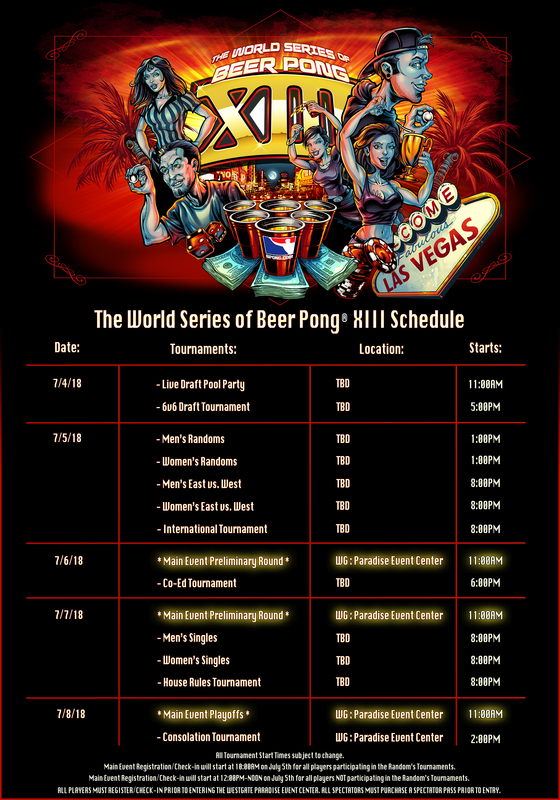 Head over to BPONG.COM/WSOBP for more information on the side events for The World Series of Beer Pong® XIII. Make sure to follow us on Facebook, Instagram, Twitter and Snapchat for more on all things related to The World Series of Beer Pong®!! Previous post: The biggest rule revisions in the history of The World Series of Beer Pong® are here!